"When the tide rises on the eastern seaboard it sets into New York Harbor and, farther to the northeast, into Long Island Sound. At New York Bay it splits at the tip of Manhattan, one current pushing up the Hudson and through the Harlem River, the other entering the East River. 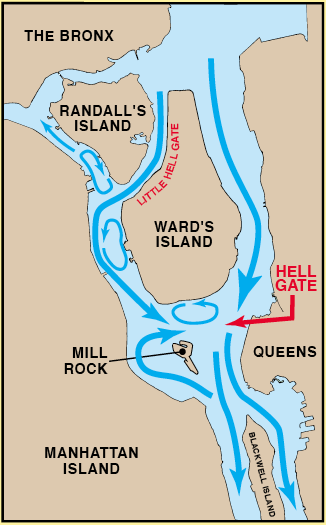 Here, with the horizontal movement impeded by the opposite flow of the Harlem River and the narrowness of the channel up to the Sound, the huge basin of Hell Gate begins to fill. The waters, like wild beasts, circle their confines, impatient for the chance to escape. The downcoming flow of the Harlem River is then stopped by the strength of the escaping currents and sent back up through Little Hell Gate and the Bronx Kills, and the channels to the west, like a sluiceway, is filled with swift seething water racing up to the Bronx shore. This flow continues for hours, building up to a high tide along the East River shore. Then at a time when other waters would settle into slack, the downcoming tide, which has been delayed four hours by the distance and the drag of the Long Island Basin, begins its relentless drive and the struggle for mastery is on. Four hours after entering the sound this tide has changed the flow of the river which is now down the narrow sluiceway from the Bronx and down Little Hell Gate Channel into Hell Gate Basin, counterclockwise around Millrock and as far down the river as the upcoming tide will allow. An hour after dropping anchor in Sandy Hook, I'd tided up on deck, called Helena to let her know I'd arrived safely, and treated myself to a celebratory drink. But there was no time to relax; I had some decisions to make. A quick check of the weather forecast showed that my weather window was closing fast. Tomorrow, Wednesday, looked good. But on Thursday, Boreas and his northerly gales were due back in town. And it looked like they planned to stay for the rest of the week, at least. Even more importantly, Thursday was Thanksgiving Day, and for months Helena had been telling me that I wouldn't be home until Thanksgiving. I was determined to prove her wrong for once! 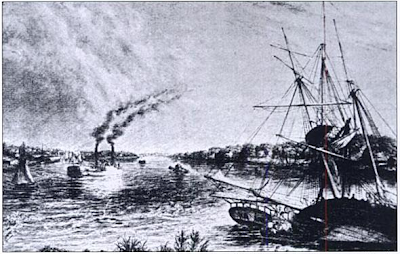 But standing between me and my triumphal arrival home was one of the most infamous hazards to navigation in the western world: the East River's Hell Gate. The East River connects New York Harbor to Long Island Sound. The only alternative route is to sail all the way around the eastern end of Long Island -- including a 100 mile offshore leg that would make 'The Hop' seem like child's play. This short cut has attracted mariners since the 1600s, for the same reason it attracted me. But that didn't mean I wasn't worried about sailing right through the biggest city on the east coast. The cruising guides didn't help. They were unanimous in saying things like "Don't let the scenery distract you! ", and "This is serious water. Pay attention!" Neither did my fellow sailors. When I wondered in my blog whether my passage through Norfolk, VA might have been good training for the East River, I got several email telling me that sailing through Norfolk was nothing compared to sailing through New York City. Nothing! But the cruising guides and sailors agreed on one thing: if you didn't get run down by a ship full of Toyotas, or crushed by a tug, or cut in half by a speeding ferry, you're bound to get swallowed up by treacherous Hell Gate, unless you time it perfectly. 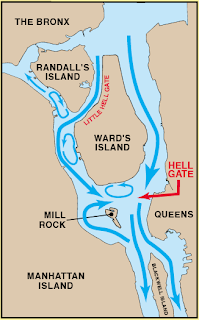 Hell Gate, infamous for its swift, reversing currents, standing waves, fog, and even whirlpools. Hell Gate, studded with rocks and reefs with names like Pot Rock, Frying Pan, Heel Tap, and Flood Rock. Thankfully, the reefs and rocks were gone, cleared by the Army Corps of Engineers in a massive 30 year civil engineering project that culminated in 1882 with the largest explosion produced by man until the atomic bomb. The explosion that removed Flood Rock was witnessed by some 50,000 New Yorkers, and described by the Times (in all caps) as "A COMPLETE SCIENTIFIC SUCCESS." But even if the rocks were gone, the fast, swirling currents, and even standing waves remained, according to all reports. 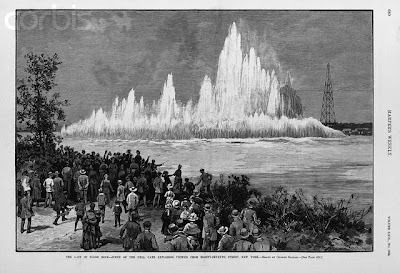 The way to avoid these hazards was to enter the southern end of the East River 1 hour after low water at the Battery (near the southern entrance of the East River). This would guarantee that I'd have the current with me all the way up the River, through Hell Gate, and out into Long Island Sound. Just one problem: low water was going to occur at 3:21 am, which was far too early, because I didn't relish crossing busy New York Harbor in the dark, and at 4:17 pm, which was far too late, because sunset would occur soon thereafter. The best I could hope for was to hit Hell Gate just before the tide turned, around 10 am. I just hoped that would be good enough. Excellent post - one thing to note that in the original dutch the name meant bright gate - with small farms on some of the now gone islands and the woods and meadows on shore, it was one of the most beautiful places in the 17th and 18th centuries. Beurtiful but dangerous..
Nice work!!! I enjoyed this very much.